April | 2011 | Tap into the Fabulous you!!! Is there such a thing as “Guy friendly makeup”? So, this weekend I gave my husband a kiss and for the next few hours he kept saying his lips were hurting and he could feel a tingling sensation. Initially, I thought he was overreacting. But then it hit me…I had on a plushglass called Girl Boy from the new MAC Quite Cute collection. Although, I personally love the formulation of plushglass, it does leave the lips with a tingling, minty sensation. I am sure he was allergic to something in the product’s ingredients. That experience got me thinking…should we think about our boyfriends, husbands or significant others when we shop for our makeup and beauty products? Eyeliner Overload: The raccoon-eye makeup look can be a big turnoff. Super Scented: Tons of perfume can make them feel breathless. Cat Woman Nails: Super-long nails aren’t really a hit. Makeup Mishaps: Seeing a girl’s foundation stop at her neckline means she can’t blend. Blinding Pearly Whites: Apparently overly-white teeth is also a turnoff (Ummm…That’s interesting). Honey Kisses: They are not a fan of sticky lip gloss. Beauty Illusions: So, I guess they don’t like when a lady draws a fake beauty mark on her face. Fake Baking: Overly tan skin is not attractive to some men. Confidence Killer: Not shaving your legs is not a deal breaker. I agree with some of their thoughts, but not all of them. What do you think? 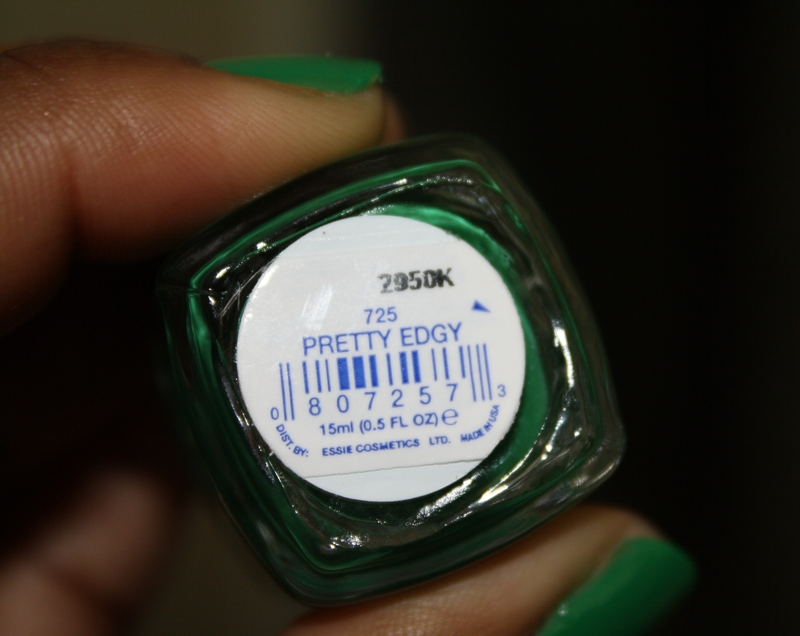 Lately, I have been feeling this nail polish by Essie called Pretty Edgy. I love the consistency and color payoff of the nail polish…just two thin coats was all I needed.